Author: Connie Henke Yarbro, RN, MS, FAAN, et al. Please note: This course is designed for oncology nurses. Those in other areas of nursing may find it challenging. 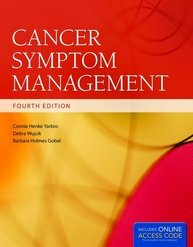 Cancer Symptom Management is designed to assist clinical oncology nurses in skillfully relieving and diminishing the cancer patient’s symptoms. Each symptom is examined in terms of its causes, pathophysiology, assessment, management, evaluation of therapeutic approaches and patient self-care. This beautifully written text provides the information necessary to provide quality care to cancer patients. Cancer14 consists of three sections, each worth 24 contact hours (total of 72 contact hours).